OTONEWS - Yamaha Motors UK will launch a 125 cc scooter Yamaha NMAX next month, but the amount of information about the specification has been outstanding. Yamaha test results in the country showed that consumption of motor fuel has reached 130 miles per gallon or about 45.7 km / liter. With the fuel-saving advantages, NMAX offer something new to the market. 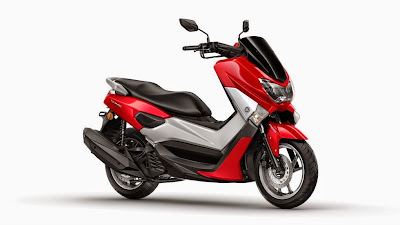 Understandably, the 125 cc scooter segment is already crowded market because it is inhabited Xmax, BW, Vity, Xenter, D'eligh, even by his own brother Yamaha Cygnus. If NMAX the 125cc fuel efficient, could not be separated from its weight only 127 kilograms. This means that he became one of the 125 cc scooter lightest in its class. Even lighter than Xmx 40 kg and 20 kg lighter than the 114 cc scooter D'elight. Another advantage offered by Yamaha is a comfortable sitting position with a large-capacity storage. Even braking system Antilock Braking System has become a standard feature. The rear suspension is equipped with rubber dampers, LED lamps become another excellent feature offered. With a rim size of 13 inches, a scooter is claimed to have more agility when lauched in urban areas. This scooter is offered in a choice of silver, red, white, and black. No Comment "Fuel consumption Yamaha NMAX European Model Claimed Reaches 45.7 Km / Liter"